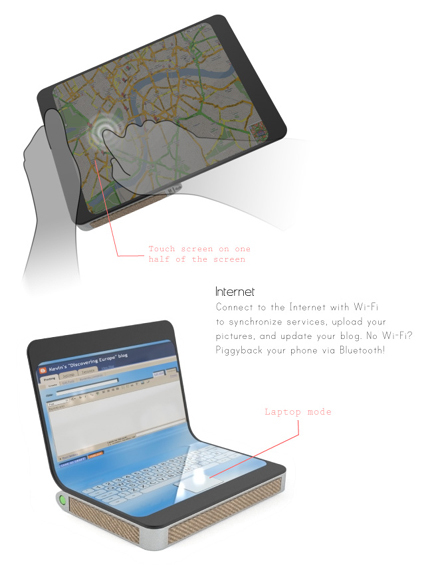 Is this laptop concept the future mobile computing? The Traveller laptop concept by Nikita Golovlev may just represent a quantum leap of what may be possible in mobile computing thanks to ePaper, the flexible plastic display under development which is downright miserly on power consumption and can provide motion graphics that are as clear as their LCD counterparts. At least in theory. Golovlev got inspiration for the design from a tourist map which provides where you get a general overview, followed by inserts with more detail. Using software on the built in hard drive (though I think flash drive is more suited to the idea), the Traveller can also be used as in concert with GPS navigation. It can also interface with any photographs stored and synced to a GPS log to show exactly where photos were taken. Then, utilizing built-in WiFi or Bluetooth, information and photographs can be shared with the world. Now granted, this is only a concept – it hasn’t even made it to the prototype stage. But it does show the potential impact ePaper can have on an industry always looking to shave a few ounces out of it’s weight. No word on if it will even get to the prototype stage, but one other question begs to be answered … with a design like this and ePaper being perfected, could it also be possible that someday we’ll see a disposable laptop? I sometimes feel like I’ve been born 200 years to soon.